Ragley Hall is at the centre of the Ragley Estate and dates back to 1680. Today, the estate covers an area of 6,500 acres and is a thriving and successful country enterprise, which includes the Farm, Butchery Department and the Sawmills, as well as a portfolio of properties in the surrounding villages. The magnificent Ragley Hall, together with The Park and Gardens are run as a tourist attraction and events venue, as well as being a family home to the 9th Marquis and Marchioness of Hertford and their four children. Arrow lies close to River Arrow and stretches out along the road from Alcester to Wixford. It is a very old village with many 16th and 17th century Listed Buildings, particularly along the road towards Alcester. The village of Arrow and the Ragley Estate are intricately bound together. The parish church of Holy Trinity is ancient and dates from the 12th century, but has undergone repeated restorations. The nave dates back to the 13th century, the tower was built in 1767. The nave and tower were restored by Frederick Preedy in 1865 when the north aisle and vestry were added. There is a Norman Doorway of distinction and in the chancel is to be found a piscina. The church contains several monuments to members of the Seymour family, who own the Ragley Estate and there is a fine alabaster erected to the memory of the late Marquis of Hertford. Arrow Rectory is partly of 16th century origin, but has been much altered and enlarged and is to be found almost opposite the church. The River Arrow has been a dominant feature of the village in the past as working mills were found at almost every mile along its course, but most have either become houses, housing estates or sadly, just simply vanished. From the top of Arrow Mill you can see Oversley Mill upstream and the site of Broom Mill downstream. Arrow Mill was a working flourmill for over a thousand years and is mentioned in the Doomsday Book of 1086. The present brick building was built in the early 1800’s and was part of the neighbouring Ragley Estate. Flour was ground at the mill until the early 1950’s and then was followed by animal feed up until 1962, at which point the mill was sold by the Ragley Estate. Over the years since the sale, Arrow Mill has evolved into the Hotel and Restaurant business of today. Central to the Mill is its wheel, which has been completely refurbished. Bearings, shaft and the timber parts have all been renewed or replaced and the wheel sluice renovated. After many stationary years the wheel is now turning again, since dredging the badly silted-up mill wheel feed returned a water flow sufficient to drive the wheel, and provide a fresh water supply to the lake in front of the Mill. There are four interesting properties around the driveway entrance down to the church, off the Evesham Road. On the corner is the Arrow Village Hall and opposite is a lovely black and white timbered house. 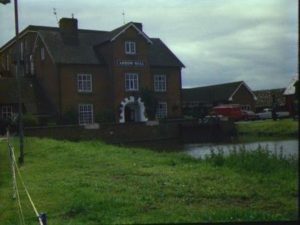 Next to that is the Victorian Old School building, which is now used for commercial use and then on the corner, where the A422 turns to Worcester is the white Old Toll House. Alcester is the quintessential English market town set in attractive rolling countryside and close to the River Arrow. Its medieval street pattern survives almost intact, along with many ancient properties. Alcester’s history extends back to Roman Times, when it was a walled town and a Roman fort of some importance being located at a junction between the Ryknield Street Roman Road, the ancient Saltway from Droitwich and the Roman Road from Stratford upon Avon and the Fosseway. The town has been the subject of numerous archaeological digs and is now one of the best understood Roman settlements in the country. Roman Alcester, which depicts life in the 1st to 4th centuries A.D. can be found at the Alcester Museum at Globe House in Priory Road, as well as the place to pick-up the Alcester Heritage Trail leaflet, which incorporates the most important historic buildings, traditional pubs and coaching inns in the town. Today, the town features architecture from the Medieval, Tudor, Georgian, Victorian and the 20th century. The oldest building in the town appears to be the lovely black and white timbered Old Malthouse, on the corner of Church Street and Malt Mill Lane and which probably dates from about 1500. Other houses of historical interest can be found in both Malt Mill Lane and in Butter Street. Until 1972 the Tudor and Victorian buildings in Malt Mill Lane were derelict and in ruins. Residents moved out of them after the Second World War. In 1972 the properties were restored and modernised and now form part of a Scheduled Housing Scheme for the Elderly. The area has won a number of awards. The Old Rectory, situated directly in front of the entrance to the church, is a particularly interesting example of Georgian architecture and a number of fine Victorian additions have been added at the rear of the house. Behind the church, at the junction of Henley Street, Church Street and Butter Street is an interesting building, which is now the Alcester War Memorial Town Hall and is held in trust for the people of the town as a Village Hall. The Hall provides the town with important function rooms. The lower storey of the Town Hall was built circa 1818 by the then Lord of the Manor (Sir Fulke Greville) as an open market, replacing the original market cross. It was later filled in to form a covered market, which also contained the town ‘lock-up’, the door of which is preserved and can be seen in the entrance hall. Also to be seen in the Hall, are the Town Stocks. The upper room, with its outstanding hammerbeam roof has remained largely as it was constructed in 1641. In 1919, the building was purchased on behalf of the people of Alcester from the Marquis of Hertford, to serve as a memorial to the men from Alcester who gave their lives in the First World War. A plaque to this effect can be seen on the wall facing the ‘Hollybush’, unveiled in 1938. St Nicholas is the central Grade 2 Listed Church of the Alcester Minster Churches. The building is an imposing sight which dominates the High Street in the town. The church has a number of interesting features including the 14th century tower, on which the clock is in an unusual position on the south-west corner, making it visible from the High Street. The church’s 18th century Georgian nave with Doric columns and plastered ceiling is believed to have been the work of Francis Smith of Warwick. Amongst the interesting monuments and artefacts to be found in St. Nicholas are the late Tudor tomb of Sir Fulke Greville and his wife in the north aisle from 1559, and a fine monument by Sir Francis Chantrey to the 1st Marquis of Hertford in the south transept from 1828. In the chancel, there is a Victorian stained glass window, but the church’s best is the modern piece from 1997 by Alan Younger, in the south aisle. The beautiful award winning restful churchyard with its wildlife sensory garden is an oasis in the town centre. 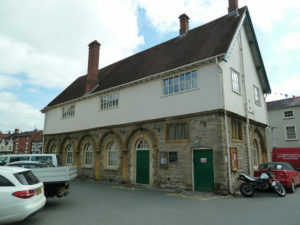 Church House, located in the Church Passageway leading to Butter Street, is the Meeting Hall and facilities of St.Nicholas Church and the Alcester Minster Churches. It only came completely into the possession of St. Nicholas Church in 1992. Prior to then the rear section and upstairs had been the property of Coventry Diocese, as part of the then Rectory, serving as its stables into the 1960’s, after which it became derelict. 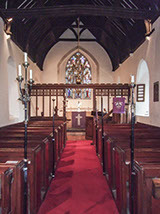 The Front Hall, then a dwelling house, had been purchased at auction by St. Nicholas Church in 1910 and converted to the hall as it remains today. When the Rectory was sold, the rear section of Church House was given by the Diocese to St. Nicholas Church, thus reuniting the whole building. There are three other places of worship in the town. Alcester Baptist Church in Church Street was built in 1859. Our Lady of St. Joseph’s Roman Catholic Church and the Alcester Methodist Church are both in Priory Road. Alcester has three main car parks in the town and all offer free parking; Bleachfield Street, Bulls Head Yard and Gunnings Bridge. Kinwarton is now a small hamlet located between the Alcester to Great Alne road and the River Alne. There was once a larger village here with a moated Grange House, which had fallen into disuse by the early 16th century. The name Kinwarton is believed to be Saxon, deriving from the popular Saxon name Kineward. The name first appears in 708 when land at Kinwarton was given by Coenred King of Mercia to Bishop Egwin towards the endowment of his newly founded monastery at Evesham. After the Dissolution of the Monasteries, the Manor was purchased by Sir Fulke Greville, 1st Baron Brooke. St. Mary the Virgin is a small church surrounded by trees in a quiet tranquil spot and has a unique peaceful atmosphere and was once at the very centre of the village. The church is open from dawn to dusk, but watch out for the three steps down into the building as you open the medieval door. The church is reputed to be of Saxon origin and certainly some of the walling especially at the east angles, appears to be of an early type. The church was rebuilt in 1316 and consecrated by the then Bishop of Worcester. Inside the church there is a 15th century sculptured alabaster panel which shows the dedication of the Madonna, Joachim and Anne bringing Mary to the Temple, with five veiled women standing by, their hands clasped in prayer, and a priest with an angel at his feet. This gem, probably part of a reredos, was found by a former Rector of this church amongst the rubbish in a carpenter’s shop at Binton in 1836. There is also a chandelier from the 18th century, a font of Norman Date, a memorial to a former Rector and a brass memorial plaque to a R.A.F Squadron Leader shot down over France in 1944. There is a small area of parking by the church. The Rectory, next door to the church, is a large Georgian red-brick house of three storeys and built in about 1788. It is now a private residence. Not far from the church is Glebe Farm and its name reflects the connection with the church, when it owned an area of land within the parish. The house of Glebe Farm is of mid 17th century square timber-framing with tiled roofs. The plan is of T shape, and the ends of the wings being gabled. A barn and other farm buildings west of the house are also timber-framed. Kinwarton Dovecote is a lovely and rare 14th century circular dovecote with metre thick walls, over 580 nesting holes and original rotating ladder. The 14th century dating comes from the ‘ogee’ arch of the doorway. It is the only remaining relic of a nearby moated Grange House belonging to the Abbey of Evesham, which was situated to the north-west of the Dovecote. The squabs, or young birds would have made good eating at a time of the year when fresh meat was scarce. Only the Lords of the Manor were allowed to build or to own a dovecote. The birds fed off the crops belonging to the Lord and the tenant farmers alike, which caused much resentment leading to Court cases in this country and to Revolution in France. Kinwarton Dovecote is managed by The National Trust.